Remember to measure your pet for the paw-fect fit.Â Pawz is the worldâ€™s only disposable and reusable, waterproof dog boot. Pawz boots are designed to go on easily and fit securely without zippers or straps. Fashionable yet durable, Pawz offers serious paw protection. Pawz is the most natural-feeling boot your dog can wear because without padding your dog feels the ground, providing a needed sense of security. Like a sock, Pawz moves with your dog, allowing full paw motion and maximum comfort. And imagine never losing another expensive dog boot again! Pawz come 12 in a package and each boot may be worn many times. Paw Width:Â While your pet's paw is still on the ground, measure from side to side at the widest point of your pet's paw, which is usually near the base of the toes. 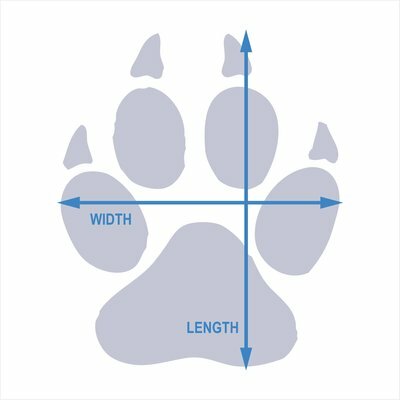 Paw Length:Â With your pet's paw on the ground, measure from the tip of the claws (those have to fit inside the shoe too) to the back of where the paw touches the ground, which is just behind the pad.